Building materials are 25 percent of new home sales price Building materials are 25 percent of new home sales price David Jones Jones, D.
The news this week about how much rising land prices add to the cost of a new home is only part of the story. Building materials themselves, particularly lumber, are going up as well. According to a new Bank of America Merrill Lynch report discussed in builderonline.com, prices for homebuilding materials increased 3.6 percent annually from 1982 to 2017. During that time, building materials in a median-priced house went from $23,073 to $80,566. Materials constitute roughly 25 percent of the sales price of a new home. 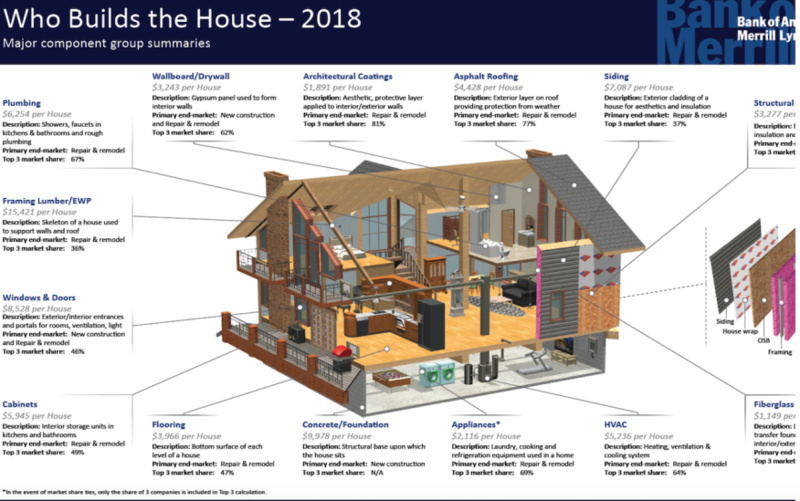 The report — “Who Builds the House" — puts the total annual cost for building materials in new U.S. single-family residences at $55 billion. The Builder article notes lumber prices have trended higher since duties of more than 20 percent were applied to Canadian softwood lumber in 2016. Imports from Canada declined from 16 billion board feet in 2016 to 14 billion in 2017.